In part 1 we discussed some of Hadoop’s core characteristics with respect to the Hadoop distributed file system (HDFS) and the MapReduce analytics engine. Now in part 2 we promised to discuss some of the other projects that have emerged to make Hadoop and specifically MapReduce even easier to use to analyze unstructured data. Casandra – which maps HDFS data into a database but into a columnar based sparse table structure rather than the more traditional relational database row form. Cassandra was written by Facebook for Mbox search. Columnar databases support a sparse data much more efficiently. Data access is via a Thrift based API supporting many languages. Casandra’s data model is based on column, column families and column super-families. The datum for any column item is a three value structure and consists of a name, value of item and a time stamp. One nice thing about Cassandra is that one can tune it for any consistency model one requires, from no consistency to always consistent and points inbetween. Also Casandra is optimized for writes. Cassandra can be used as the Map portion of a MapReduce run. Hbase – which also maps HDFS data into a database like structure and provides Java API access to this DB. Hbase is useful for million row tables with arbitrary column counts. Apparently Hbase is an outgrowth of Google’s Bigtable which did much the same thing only against the Google file system (GFS). In contrast to Hive below Hbase doesn’t run on top of MapReduce rather it replaces MapReduce, however it can be used as a source or target of MapReduce operations. Also, Hbase is somewhat tuned for random access read operations and as such, can be used to support some transaction oriented applications. Moreover, Hbase can run on HDFS or Amazon S3 infrastructure. Hive – which maps a” simple SQL” (called QL) ontop of a data warehouse built on Hadoop. Some of these queries may take a long time to execute and as the HDFS data is unstructured the map function must extract the data using a database like schema into something approximating a relational database. 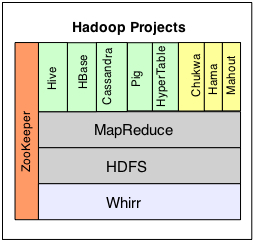 Hive operates ontop of Hadoop’s MapReduce function. Hypertable – is a Google open source project which is a c++ implementation of BigTable only using HDFS rather than GFS . Actually Hypertable can use any distributed file systemand and is another columnar database (like Cassandra above) but only supports columns and column families. Hypertable supports both a client (c++) and Thrift API. Also Hypertable is written in c++ and is considered the most optimized of the Hadoop oriented databases (although there is some debate here). Pig – is a dataflow processing (scripting) language built ontop of Hadoop which supports a sort of database interpreter for HDFS in combination with an interpretive analysis. Essentially, Pig uses the scripting language and emits a dataflow graph which is then used by MapReduce to analyze the data in HDFS. Pig supports both batch and interactive execution but can also be used through a Java API. Mahout – an Apache open source project which applies machine learning algorithms to HDFS data providing classification, characterization, and other feature extraction. However, Mahout works on non-Hadoop clusters as well. Mahout supports 4 techniques: recommendation mining, clustering, classification, and itemset machine learning functions. While Mahout uses the MapReduce framework of Hadoop, it doesnot appear that Mahout uses Hadoop MapReduce directly but is rather a replacement for MapReduce focused on machine learning activities. Hama – an Apache open source project which is used to perform paralleled matrix and graph computations against Hadoop cluster data. The focus here is on scientific computation. Hama also supports non-Hadoop frameworks including BSP and Dryad (DryadLINQ?). Hama operates ontop of MapReduce and can take advantage of Hbase data structures. Chukwa – which is used for monitoring large distributed clusters of servers. ZooKeeper – which is a cluster configuration tool and distributed serialization manager useful to build large clusters of Hadoop nodes. MRunit – which is used to unit test MapReduce programs without having to test it on the whole cluster. Whirr – which extends HDFS to use cloud storage services, unclear how well this would work with PBs of data to be processed but maybe it can colocate the data and the compute activities into the same cloud data center. As for who uses these tools, Facebook uses Hive and Cassandra, Yahoo uses Pig, Google uses Hypertable and there are myriad users of the other projects as well. In most cases the company identified in the previous list developed the program source code originally, and then contributed it to the Apache for use in the Hadoop open source project. In addition, those companies continue to fix, support and enhance these packages as well.